Peck's Slip, N.Y.C. 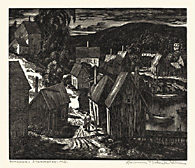 = 1934, Drypoint. Edition proofs only. 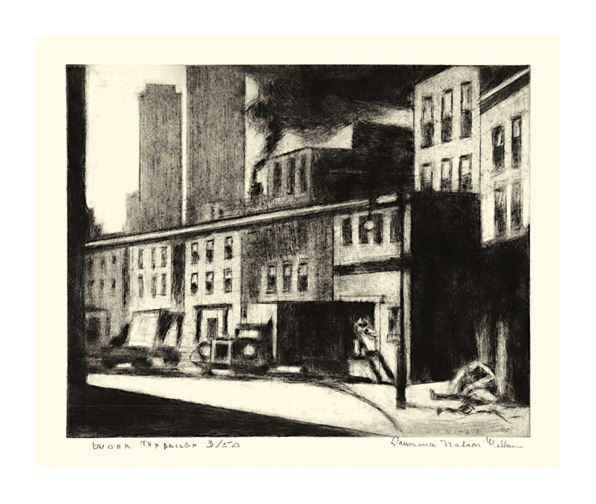 Signed titled and inscribed ARTIST PROOF in pencil. 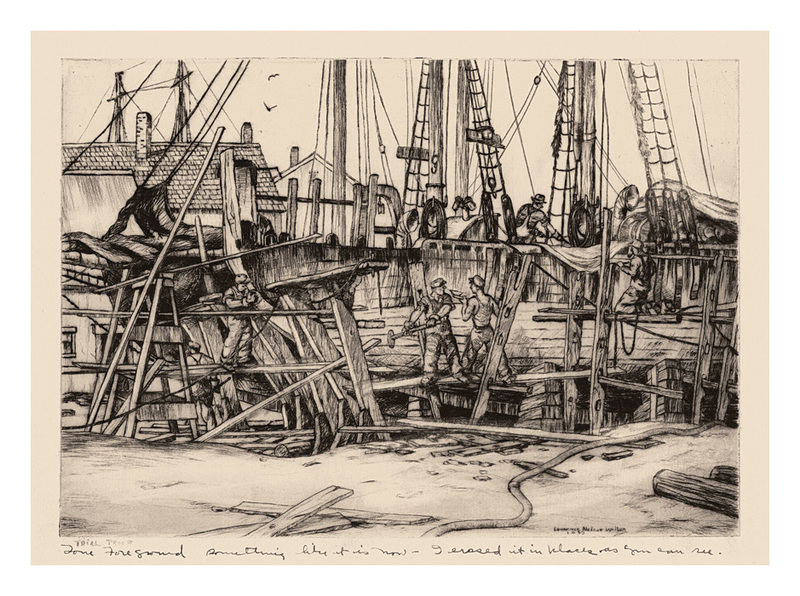 Annotated in pencil, ENGRAVED & PRINTED BY THE ARTIST. FROM HIS W.C. 1934 in the bottom sheet margin. Image size 6 3/4 x 8 11/16 inches (171 x 221 mm); sheet size 8 7/8 x 11 inches (225 x 279 mm). A superb, richly inked impression, in dark sepia ink, on cream wove paper, with full margins (7/8 to 1 1/4 inch), in excellent condition. A scarce, early impression, printed by the artist. 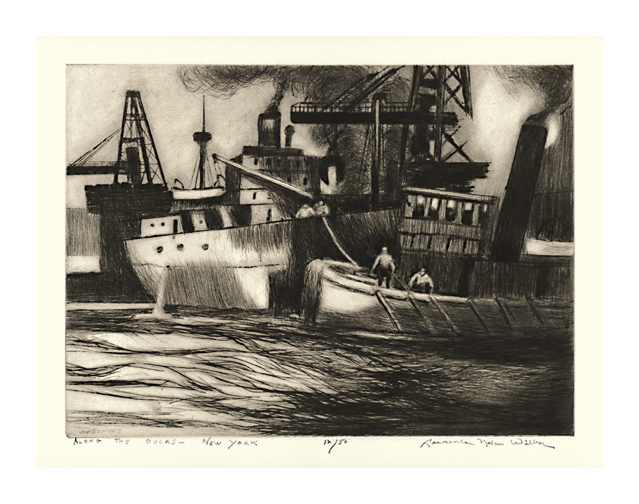 Ship Building, Gloucester = 1943, Drypoint and Pencil. Edition not stated. Signed and dated in the plate, lower right. Annotated TRIAL PROOF and Tone Foreground something like it is now - I erased it in places as you can see in ink, in the bottom sheet margin. Image size 7 5/8 x 11 inches (194 x 279 mm); sheet size 11 3/4 x 15 1/4 inches (298 x 387 mm). A fine, working proof impression, with rich burr, on cream laid paper; margins trimmed by the artist (1 3/4 to 2 1/2 inches). Touched by the artist with extensive graphite additions and erasing of plate tone. 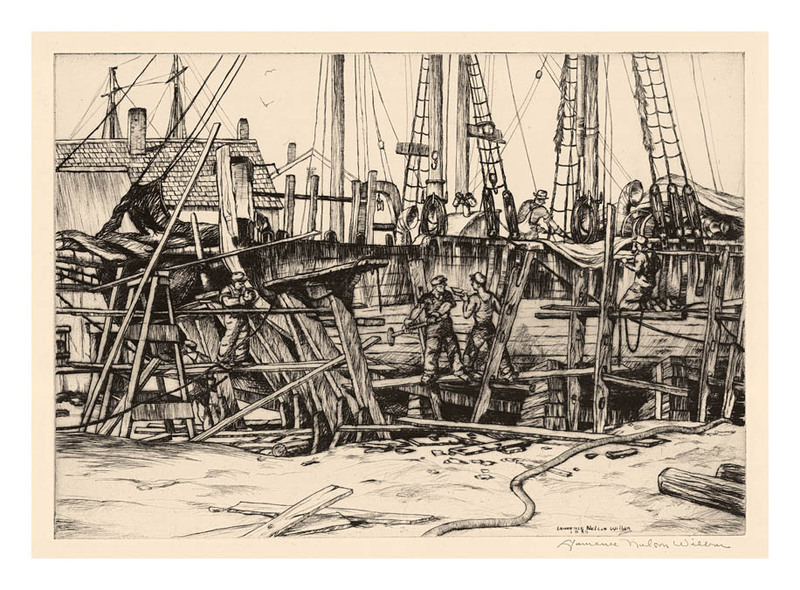 Ship Building, Gloucester = 1943, Drypoint. Image size 7 5/8 x 11 inches (194 x 279 mm); sheet size 11 1/2 x 14 1/4 inches (292 x 362 mm). A fine impression, on cream wove paper, with full margins (1 1/2 to 2 1/8 inches), in excellent condition. 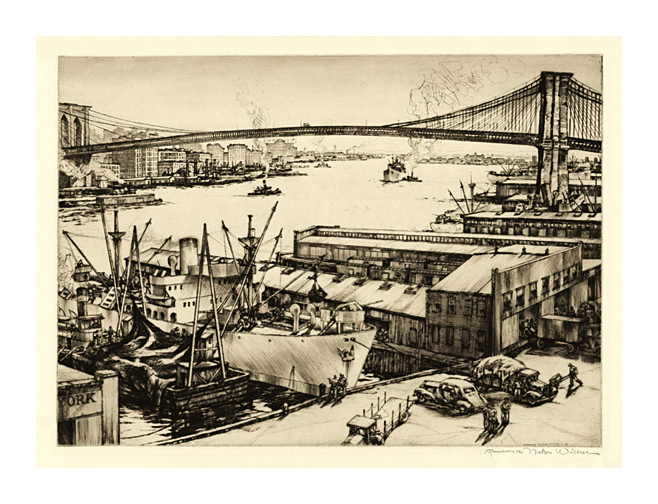 The East River = 1946, Drypoint. Edition 65. Signed in pencil. Signed and dated in the plate, lower right. Image size 9 7/8 x 13 15/16 inches (251 x 354 mm); sheet size 12 1/2 x 16 3/4 (318 x 425 mm). A fine impression, on cream wove paper, with full margins (1 to 1 3/8 inches), in excellent condition. 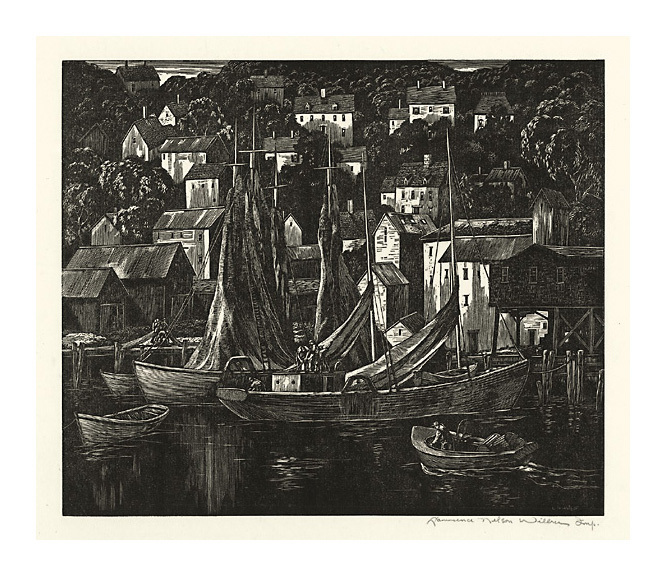 Tranquil Harbor = 1958, Wood Engraving. Edition 55. Signed in pencil. Signed in the block, lower right. Image size 8 3/8 x 10 1/16 inches (213 x 155 mm); sheet size 10 5/8 x 12 1/2 inches (270 x 318 mm). A fine impression, on cream laid Japan, with full margins (1 1/8 to 1 3/8 inches), in excellent condition. Printed by the artist. 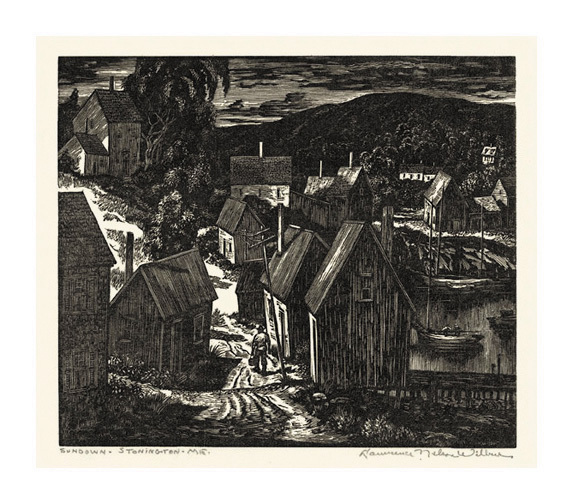 Sundown, Stonington, Maine = 1969, Wood Engraving. Edition not stated. Signed and titled in pencil. Signed in the block, lower right. Annotated OK - EXTRA SPECIAL - ENGRAVED AND PRINTED BY THE ARTIST - - EXHIBITION PROOF - in pencil in the bottom sheet edge. Image size 5 1/8 x 6 1/16 inches (130 x 154 mm); sheet size 7 1/16 x 8 3/16 inches (179 x 208 mm). A fine impression, on cream wove Japan, with full margins (3/4 to 1 1/8 inches), in excellent condition. Printed by the artist. 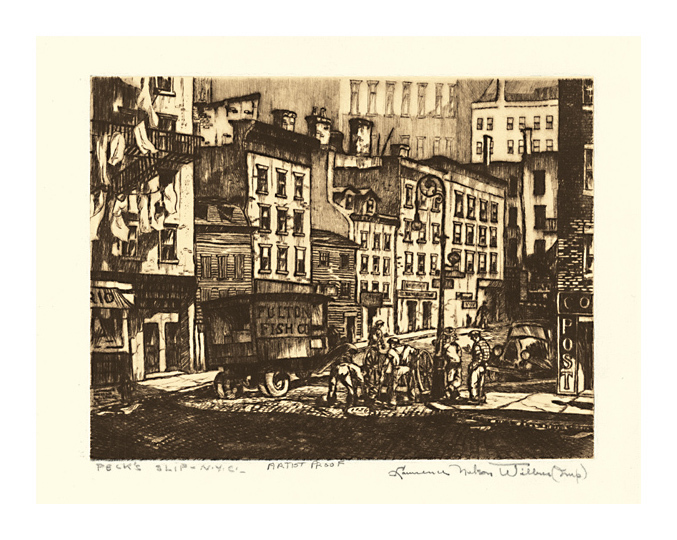 Along the Docks, New York = 1985, Etching. Edition 50. Signed, titled and numbered 12/50 in pencil. Signed and dated in the plate, lower left. Annotated FROM A 1936 WATERCOLOR BY THE ARTIST in pencil, in the bottom sheet edge. Image size 9 7/8 x 13 11/16 inches (251 x 348 mm); sheet size 15 x 19 (381 x 483 mm). A fine, richly inked impression, on off-white wove paper, with full margins (2 1/4 to 2 3/4 inches), in excellent condition. 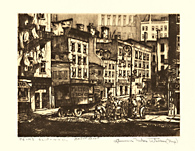 Under the Bridge = 1988, Etching. Edition 50. Signed, titled and numbered 3/50 in pencil. Signed in the plate, lower right. Image size 9 3/8 x 12 inches (238 x 305 mm); sheet size 15 x 22 1/4 (381 x 565 mm). A fine, richly inked impression, on off-white wove paper, with full margins (2 1/4 to 5 1/4 inches), in excellent condition. 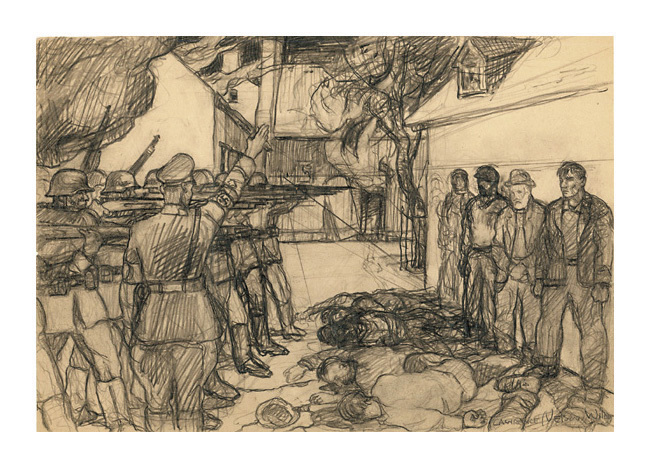 The Hostages = 1939, Pencil. Signed in pencil, in the image, lower right. Image size 8 5/16 x 12 1/8 inches (211 x 308 mm). A bold, spontaneous rendering, on buff wove paper, in excellent condition. The sheet trimmed by the artist to the image edges. 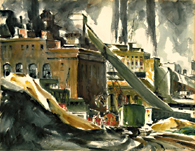 Icing Down (Gloucester) = 1939, Watercolor. Signed and dated, lower left. 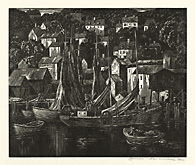 Image size 19 1/4 x 25 1/4 inches (489 x 641 mm). A fine, spontaneous rendering, with fresh colors, on watercolor paper; the image extending to the sheet edges, in excellent condition. 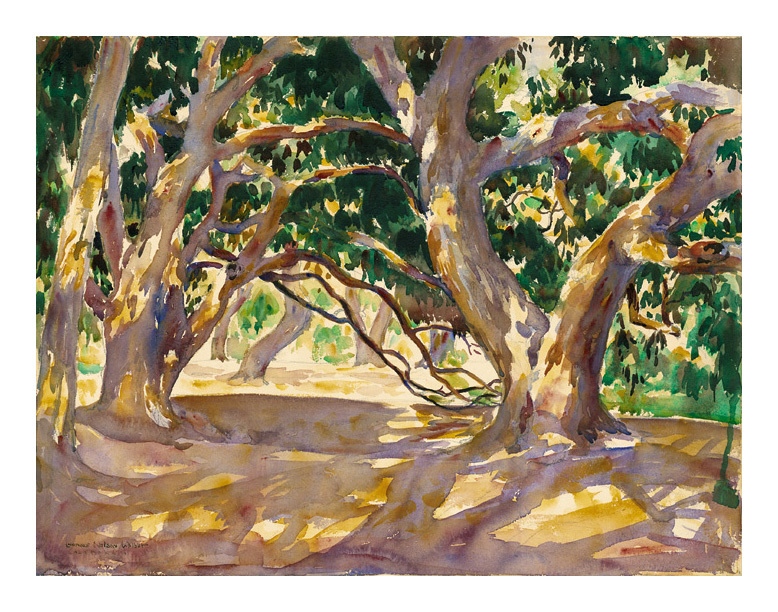 California Live Oaks = c.1945, Watercolor. Signed and annotated CALIFORNIA, lower left. Image size 20 x 26 inches (508 x 660 mm). 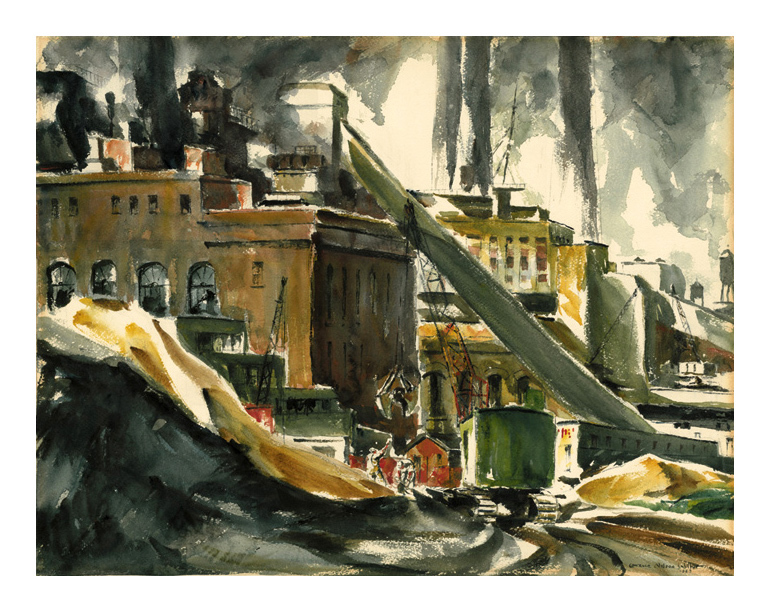 Con Edison Power Plant, New York = 1949, Watercolor. Signed and dated in ink, lower right. 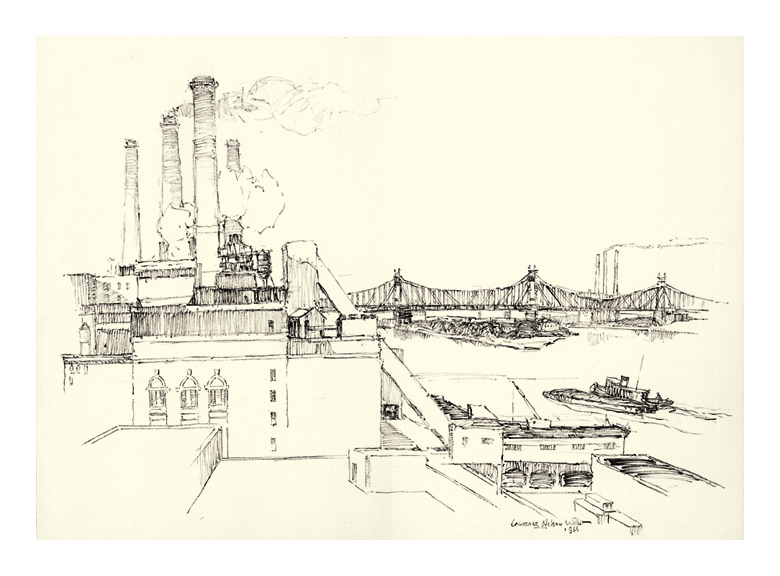 Titled in the artist's hand on the backing board CON EDISON POWER PLANT. Image size 19 3/4 x 25 3/4 inches (502 x 654 mm). 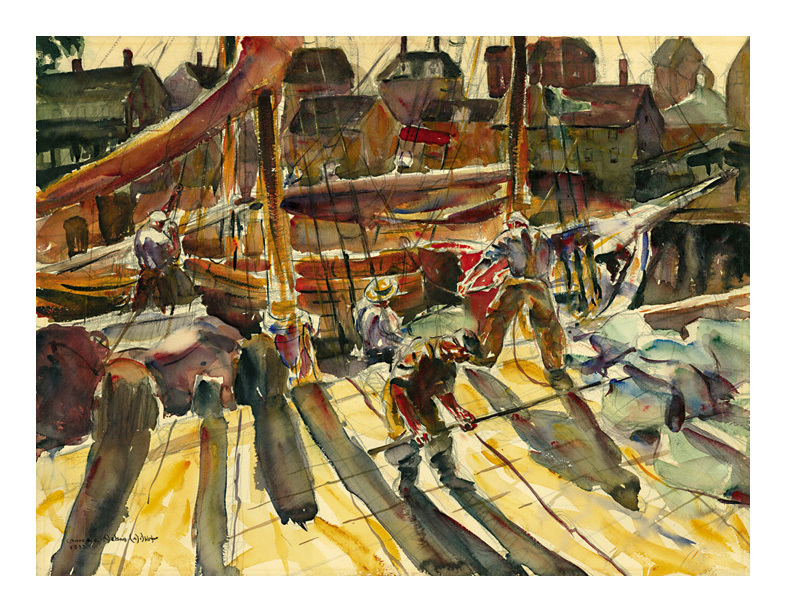 A fine, spontaneous rendering, with fresh colors, on watercolor paper, the image extending to the sheet edges. Mat line at the outside sheet edges recto; masking tape adhesive remains at the sheet edges verso, not affecting the image, otherwise in excellent condition. 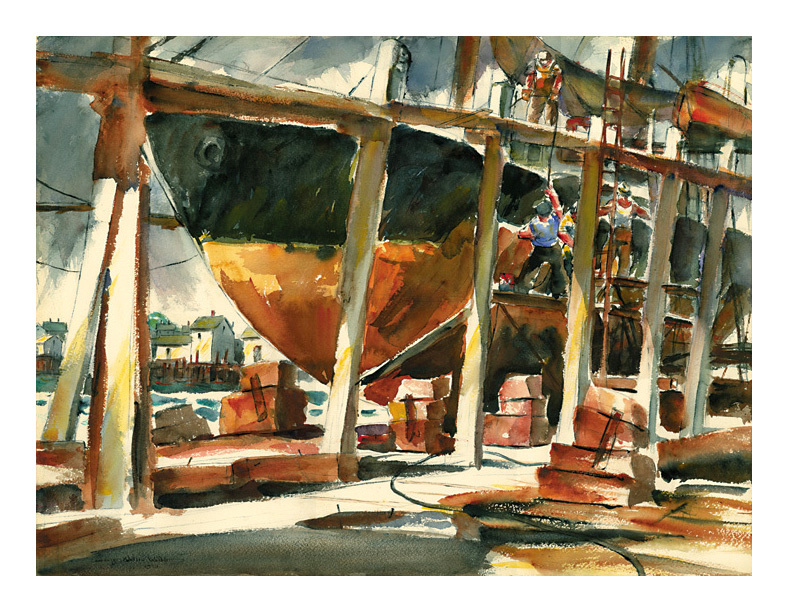 Untitled (Drydock, Gloucester) = 1953, Watercolor. Image size 19 7/8 x 25 7/8 inches (505 x 657 mm). A fine, spontaneous rendering, with fresh colors, on watercolor paper, the image extending to the sheet edges. Brown paper tape remains on the sheet edges, verso; in excellent condition. 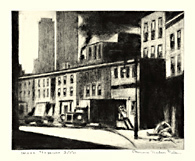 Power Station, NYC = 1966, Brush and Ink. Signed and dated, lower right. Titled in pencil, beneath the image, lower right. Image size 13 1/2 x 19 1/4 inches (243 x 489 mm); sheet size 16 3/8 x 21 3/4 (419 x 552 mm).